Travel to Peru, visit and enjoy with us the Peru and discover the following destinations: Machu Picchu, Sacred Valley, Sacsayhuaman, Pisac, Ollantaytambo, Titicaca Lake and The Uros and Taquile islands, Arequipa and the Colca Canyon, Nazca Lines and the Ballestas Islands, Pachacamac, Chan Chan and The Lord of Sipan, The Amazon River and Amazon Jungle, Tambopata and The Manu Biosphere Reserve. We will help you to discover the Andes, the virgin rainforest in the south and north of Peru, Cusco, Arequipa, Lima, Puno and all of Peru. Our company offering you the best Peru vacation packages at affordable prices. We have for your travel, flexible programs and you can customize to suit your needs. You can pick the tour you like or you can book a complete program with us. We are a Travel Agency with 8 years of experience. We have operators in the most important tourist places in Peru and South America. Enjoy your visit to Lima (City Tour), Travel to Cusco (City Tour: The Cathedral, Koricancha, Sacsayhuaman, Pucapucara, Tambomachay), Sacred Valley: Pisac, Ollantaytambo, Chincheros and Machupicchu 2 days / 1 night. Lima, Cusco (Sacsayhuaman, Puca Pucara, Kenko, Tambomachay), Sacred Valley (Pisac, Ollantaytambo, Chincheros), Machu Picchu 2days 1 night, Santiago de Chile, Easter Island (Vaihu, Akahanga, Tonqariki, Nau Nau, Rano Raraku volcano. Lima, (city rour); Cusco (city tour), Sacred Valley (Pisac, Ollantaytambo, Chicheros), Machu Picchu 2d/1n. Lima city tour, Lima Downtown: mayor square, Convento San Francisco y Catacumbas, El Olivar en San isidro, Larco Mar en Miraflores - Lima - Cusco, city tour and visit a: mayor square, the Cathedral, Koricancha 4 local archeological sites: Sacsayhuamán, Quenco, Puca Pucara y Tambomachay, Sacred Valley Pisac, Ollantaytambo y Chicheros, Machu Picchu 2 days 1 night by train - Cusco to La Paz (Bolivia), City tour, Tiahuanaco, La Paz to Buenos Aires (Argentina), City tour, Iguazu Falls. With an area of 1,285,215 square km, Peru is the third-largest country in South America after Brazil and Argentina, ranking it amongst the world's 20 largest nations. Peru also holds sway over the sea up to 200 miles from the Peruvian coast and has territorial rights to an area of 60 million hectares in the Antarctic. Peru is divided into 24 departments. Lima is the capital of Peru. Peru is a nation of mixed ethnic origins. Throughout its history, Peru has been the meeting ground for different nations and cultures. The indigenous population was joined 500 years ago by the Spaniards. As a result of this encounter, and later enriched by the migration of African blacks, Asians and Europeans, Peruvian man emerged as the representative of a nation whose rich ethnic mix is one of its leading characteristics. The official currency in Peru is the Nuevo Sol (S/. ), which is divided into 100 centimos. The currency includes coins for 5, 10, 20 and 50 centimos and 1, 2 and 5 sol coins. There are bills in the denomination of 10, 20, 50, 100 and 200 Nuevos Soles. Peru is a democratic republic. The president and members of Congress are elected every five years by universal suffrage. The current constitutional president of Peru is Alan Garcia Pérez (2006-2011). Peru is divided into three regions: the coast, the highlands and the jungle. Although this simple division is a fair portrait of Peru's geography, the reality is much richer and far more complex: in Peru, nature appears to have taken on particular characteristics which have turned its mountains, plains, jungles and valleys into unique habitats. An extraordinary variety of eco-systems shelters a wide diversity of animals and plants. Heir to ancient cultures and a rich colonial tradition, Perú is a magical spot which involves one of the richest biodiversities of Earth, and is a melting pot of different cultures who together are forging the promise of a better future. - 927 two star-hotels, 411 one star-hotels and 42 logdes. - 14 airports equipped to receive commercial flights and 10 ready for international flights: Lima, Arequipa, Chiclayo, Pisco, Pucallpa, Iquitos, Cusco, Trujillo, Tacna and Juliaca. Ten thousand years of history are lived through 180 museums and historical places. While Peru inevitably evokes images of Machu Picchu and the Inca empire, the country is also riddled with archaeological sites which are a legacy of even more ancient times, when great civilizations bequeathed a legacy of their art, customs and rituals, their wisdom and skills. - As home to 84 of the 104 life zones that exist on our plant makes Peru a privileged destination for nature lovers. - Close to 20% of the worlds birds and 10% of the world's reptiles live here. - Peru has converted 13% of its territory into Protected Natural Areas. Peru is a country that sings and dances in joy and sadness with color and a great deal of paraphernalia. Peruvians celebrate some 3,000 festivals all over the country. Over 40,000 restaurants across the country reflect the diversity of a nation that has mixed its native traditions with the cuisines of Europe, Arabia, China, Africa and Japan. The result: unique flavours that make Peruvian cuisine one of the best and most varied in the world. Recipes such as cebiche (raw fish marinated in lemon juice), pachamanca (meat and vegetables cooked underground), chupe de camarones (shrimp soup), ají de gallina (spicy chicken) and juanes (cornmash pastries) are just a few of the mouth-watering dishes served up in Peru. Peru was gifted with lands and seas of divine abundance and we, the Peruvians, for centuries now, have given thanks for this gift by cooking, eating, and creating just as the gods do. the virgin rainforest in the south and north of Peru. Our programs are flexible and you can customize to suit your needs. You can pick the tour you like or you can book a complete program with us. We have a team of professional sales executives to assist you. Travel to Peru, explore the amazing sites of Machu Picchu, Choquequirao, Sillustani or Kuelap, fly over the Nazca Lines, explore the Manu rainforest, navigate the Titicaca Lake or walk the Inca Trail. Practice your favorite adventure sport on the coast, rivers or mountains or enjoy the wide variety of flora and fauna of the Peruvian Amazon jungle. Ecology and untouched nature travel opportunities. Come with us to explore and enjoy the wilderness our country offers the traveller. While Peru inevitably evokes images of Machu Picchu and the Inca empire, the country is also riddled with archaeological sites which are a legacy of even more ancient times, when great civilizations bequeathed a legacy of their art, customs and rituals, their wisdom and skills. The Inca empire was a recent arrival during the process of cultural development in the Andes during the pre-Hispanic era, and the history of the Incas barely accounts for a century within the 20,000 years of human occupation of Peruvian territory. Much earlier than the Incas and while civilizations like the Mesopotamian, Egyptian, Indian, and Chinese (3000 and 2000 B.C.) flourished, the city of Caral, located north of the city of Lima-Peru, was built; this was the first American expression of a Pre-Ceramic urban settlement with monumental architecture in an area greater than 10 hectares. Later, in the northern highlands, the Chavin (800 – 200 B.C.) achieved significant advances in architecture, engineering, and agriculture. The Chavín civilization (1500-400 BC) achieved considerable prowess in architecture, engineering and agriculture in the northern highlands. Along the north coast, the Moche civilization (200 BC-700 AD) is famous for its realistic pottery (portraits carved into pots and gourds) and its pyramid-shaped temples. The same area was later controlled by the Chimú kingdom (900-1450 AD), who built Chan Chan, an immense mud-brick citadel featuring 12-meter-high walls and superb architectural work. To the south, the Nazca people (200 BC-900 AD) etched an impressive series of figures etched into the desert floor known as the Nazca Lines, while graves belonging to the Paracas culture (800 BC-600 AD) have unearthed superb weavings which point to the magical and religious vision that governed the lives of this ancient civilization. Centuries later, the Incas (1300-1500 AD) were to make Cusco the center of their empire, building major constructions such as Sacsayhuaman, Pisac and Koricancha. It is here that myth and history merge, where the Inca roads, the towns, people and traditions are a living example of the Andean spirit, sacred and monumental. "Peruvian Tours" is a specialist tour operator, offering a wide variety of tours and services throughout Peru. With many years experience in the tourism industry, our Travel Agency offers a highly professional and personalised service. Our expert services include airport transfers, domestic air ticketing, land travel, a complete hotel reservation service from luxury to tourist class hotels, excursions, multilingual guides. Discover why Peru is for many the heart of South America's greatest civilizations!. Let us show you our country!. Travel to Peru with Us. Lima, Sep. 29 (ANDINA). Investments in the hotel and restaurant sector in Peru amounted to US$ 1.5 billion between 2009 and 2012, mainly concentrated in the regions of Lima and Cusco, The National Chamber of Tourism (Canatur) has said. The entity which represents diverse private actors and tourism services’ suppliers noted that 90 percent of investments in the country's tourism sector was carried out by Peruvian capitals. "Little by little, it is being observed a diversification of investments toward other inner regions, in particular in the beaches of the country's northern regions," said the association according to Scotiabank's weekly report. In this regard, Canatur stressed that it is becoming more frequent for international hotel chains to grant permits to local entrepreneurs to enter or increase penetration of their franchises in the Andean country. Lima, Sep. 27 (ANDINA). Foreign and domestic tourists arriving at Cusco's airport were welcomed today with traditional dances and souvenirs, as part of celebrations to mark International Tourism Day. The activity was organized by Cusco's Regional Directorate of Foreign Trade and Tourism (Dircetur) and started on Friday morning at Velasco Astete Airport. Among the dances on display were Wallata Sacacocha, carnaval de Ccatcca, and la marinera cusqueña, tourists also received some souvenirs like chuspita (small pouch with zipper). Foreign tourists came from Spain, France, United States, Mexico and Venezuela. Tourism in Cusco has recently grown by 15%, and that around 2 million travellers will have visited Cusco by the end of 2013. London, Sep. 26 (ANDINA). London restaurant Lima has become the first Peruvian restaurant to win a Michelin star, one of the highest culinary awards in Europe. Lima, the leading exponent of one of London’s hottest gastronomic trends, was awarded the prestigious accolade today little more than a year after opening, the London Evening Standard reported. Located in Fitzrovia, the restaurant was launched by Venezuelan brothers Gabriel and Jose Luis Gonzalez with renowned Peruvian chef Virgilio Martinez, and has enjoyed huge popularity with dishes such as sea bream ceviche and suckling pig “Andes”. "It was definitely not expected. I thought we might be included in some way, in the Bib Gourmand [awarded for value dining], but not to get a Michelin star," Gabriel Gonzalez said. "It’s just incredible, it definitely sets a precedent for Peruvian food and gives it a stamp of credibility and a lot of promise, it’s just amazing." Lima was among a raft of London restaurants to be recognized by the French guide, bringing the British capital’s overall Michelin presence up to 54 one-star, nine two-star and two three-star restaurants. Cusco, Sep. 24 (ANDINA). The southeastern region of Cusco expects to attract over 1.5 million tourists from Peru and over the world, regional authorities said Tuesday. Cusco. Photo: ANDINA / Percy Hurtado. The head of Cusco's Regional Directorate of Foreign Trade and Tourism, Madison Barreto Jara, told Andina news agency that until August the region received 1.2 million tourists, and this month more than 300,000 people are estimated to arrive in Cusco. These figures are based on tourist package bookings, and arrivals at Cusco's Alejandro Velasco Astete airport. Among the region's top tourist destinations are the Sacred Valley of the Incas, which is home of the Ollantaytambo, Pisac, Moray and Chinchero archeological sites; and the South Valley with the Tipon and Pikillaqta parks. Other Cusco's iconic places which attract more tourists include Cusco's stunning baroque churches located in its historical center, as well as nearby attractions such as Sacsayhuaman, Puca Pucara and Tambomachay. Peru to promote its cuisine at Chefs Congress in U.S.
Lima, Sep. 23 (ANDINA). Peru's Export and Tourism Promotion Board (PromPeru) will attend the Starchefs International Chefs Congress in New York, United States, to showcase the international appeal and gastronomic innovation of the Andean country, it was reported Monday. food without transgenic to preserve the biodiversity. According to a resolution released Monday, the participation of the commission is aimed at promoting Peru's cuisine among American opinion leaders and the country as a dining destination in that market. Likewise, the entity intends to promote agribusiness and fishery products for human consumption that are part of the Peruvian exportable offer and are typical of the food supplies. In pursuing this aim, the Department for the Promotion of Country Image at PromPeru has authorized the trip of Camila de Lourdes Garcia to take part in the event. PromPeru is the Peruvian government’s agency whose task is to articulate the initiatives of public and private institutions in order to promote tourism, exports and investment. Lima, Sep. 19 (ANDINA). The Peruvian Society of Gastronomy (Apega), organizers of the annual Mistura food festival in Lima, have expressed delight at the success of this year's event recently held on the capital's Costa Verde beach. 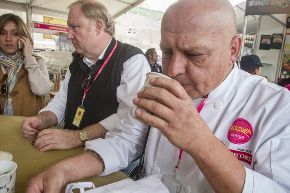 The ten-day festival attracted a record 24,000 foreigners, including 300 journalists and more than 20 world-renowned chefs who took part in the first-ever Encuentro Gastronómico. According to Apega, journalists came from as far as China, Japan, Denmark, Sweden, the United States, Mexico and Portugal to cover the largest food festival in Latin America and possibly in the world. Official figures show that more than 387,000 tickets were sold for this 6th edition of Mistura, an increase of seven percent over last year's event. "If we add the visits of guests, employees and accredited people, the number of visitors reaches half a million," APEGA said in a statement on Wednesday. Mistura 2013 took place from September 6-15 on a kilometer-long stretch of the Costa Verde beach in Lima's Magdalena del Mar district. Lima, Sep. 17 (ANDINA). 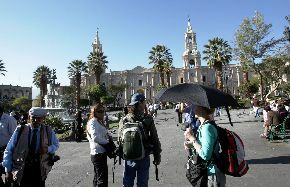 Nearly 4,000 reservations to visit Arequipa's main tourist attractions have been booked by the attendees of the 31st Perumin Mining Convention, the city’s travel agencies and tourism association reported Tuesday. The head of the entity, Eddy Carpio, noted that the most attractive tourist destinations are located in the historic center of the White City and hailed the enormous benefits which this events brings to Arequipa's tourism sector. "Over 4,000 people will have tourist services within the city, including the Monastery of Santa Catalina, the Museum of Andean Sanctuaries which is home of the mummy Juanita, the Recoleta Convent and all the churches that are within the historic center," he told Andina news agency. Iquitos, Sep. 14 (ANDINA). A blessing ceremony on the banks of the Amazon River and host of special guests and past travelers marked the inaugural Amazon cruise for International Expeditions’ new riverboat La Estrella Amazonica. “After spending the past two weeks in the Amazon and traveling with our guests, I can safely say that La Estrella Amazonica has exceeded our very high expectations in terms of style, comfort and spaciousness,” said IE President Van Perry. La Estrella Amazonica offers accommodations for a maximum of 31 guests in 15 outward-facing cabins. Each air-conditioned cabin measures approximately 220 square feet and feature furniture hand-crafted by Peruvian artisans, native handicrafts and textiles from Amazonian tribes and river villages, and ample private baths decorated with Italian tile. “With this new riverboat, we have been able to bring the warmth of Peru and the villages along the river into the décor found in each cabin and our public spaces,” said Senior Expedition Leader Jorge Salas, who is overseeing riverboat operations in Peru. Lima, Sep. 08 (ANDINA). Tourist visits to the Colca Valley in the southern Arequipa region topped more than 117,000 between domestic and foreign, so far this year, the manager of the Colca Autonomous Authority (Autocolca), Fredy Jimenez said Sunday. The Colca Valley, in southern Peru's Arequipa region. The official noted that Arequipa's top tourist attraction received 21,128 domestic and foreign tourists in August, an amount similar to that recorded the same month of the previous year. 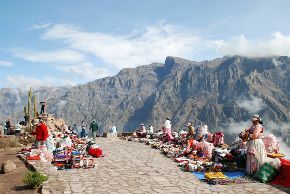 Likewise, a total of 54,000 domestic visitors arrived in the Colca Valley in the same month as they were benefited from the waive admission fee program promoted by the regional government to foster the inbound tourism. The Colca Valley, approximately 160 kilometers from Arequipa, is a colorful Andean valley with pre-Inca roots and towns founded in Spanish colonial times.